Aerogel is an ultralight material, synthetically produced from a gel in which the liquid component has been replaced by a gas. The transparent material is among the lightest solids known to man (3mg / cm2) , just recently ousted by the even lighter aerographite (0.18mg / cm2) , and exhibits outstanding low density and thermal conductivity and amazing strength, considering its weight. The term aerogel was first introduced in 1932 by American scientist and chemical engineer Samuel Steven Kistler (1900 – 1975). The commercialisation of aerogels began in 1942 with the Monsanto cooperation producing Santocel. Mosanto described the product as “a light, friable, slightly opalescent solid containing as much as 95 percent air volume. It is a very effective heat insulating material. 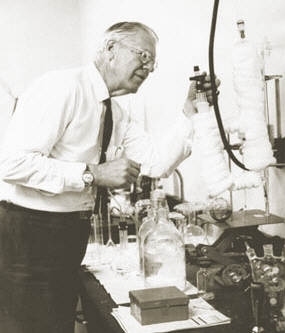 Due to the high costs involving production, and the development of inexpensive silica, the company discontinued its research into aerogels in the 1960s. Interest in the material, and especially its very low thermal conductivity, re-emerged in the 1980s as energy conservation became more and more important. However, the high fabrication costs still prevent its larger application. Despite its extreme lightness, which is between 50 – 99 % of the original material’s volume, it is very strong structurally, due to its dendritic microstructure. 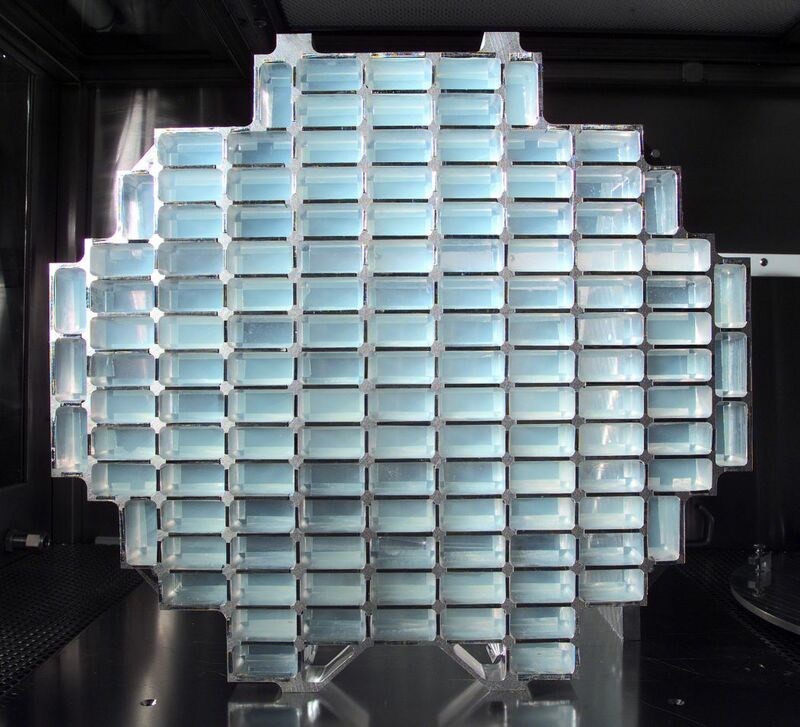 In this structure, which breaks the shorter wavelengths of visible light and gives the gel its smoky blue color, spherical particles are joined into clusters that form three-dimensional, extremely porous fractal chains. Since the pores, which are in the nanometer range, are too small for air to travel through, the material is a highly effective insulator. While the size and density of the pores can be controlled in the manufacturing process, the particular structural arrangement however makes aerogels very fragile and prone to shattering. The most common types of aerogel are based on silica, carbon and metal oxides, with silica aerogel being the most extensively studied and applied. 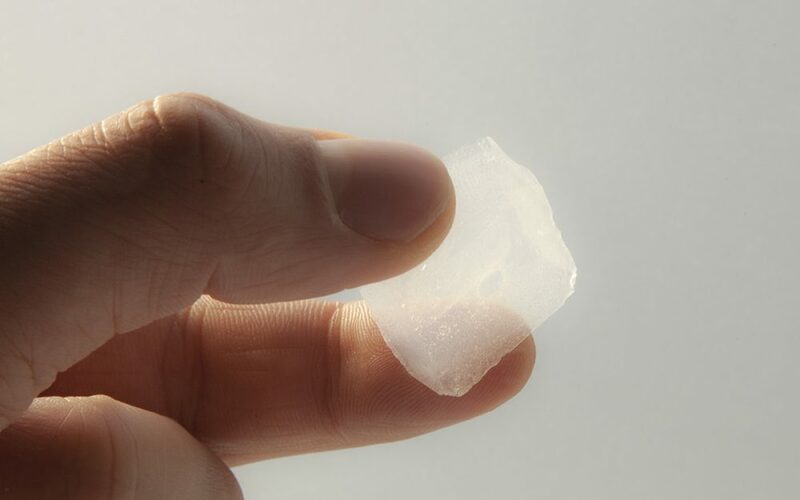 Silica aerogels, which as of 2011 held 15 entries in Guinness World Records for material properties, look like glass and are often used as insulation due to their remarkable low thermal conductivity . Carbon-based ones are black and exhibit electrically conductive capabilities together with an extremely high surface area, which makes them useful for supercapacitors or fuel cells. Metal oxide aerogels can be magnetic and depending on the dopant exhibit slightly different bright colors. They are used as catalysts in chemical transformations, the production of explosives or carbon nanotubes. 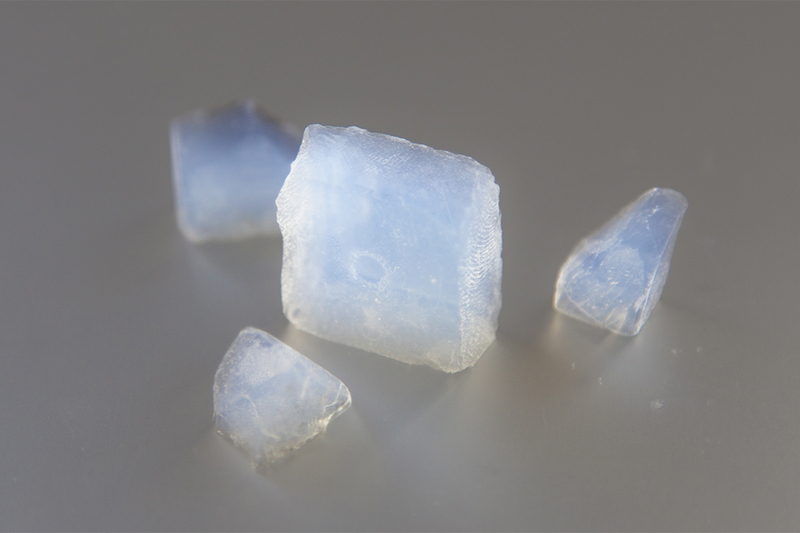 Silica based aerogels have been used in a variety of practical applications ranging from several NASA missions, like the insulation on the Mars Rover or a dust collector for the Stardust spacecraft, to commercial products like insulation for freezers, in between panes of glass as translucent panels or reinforced with fibers as flexible aerogel blankets. 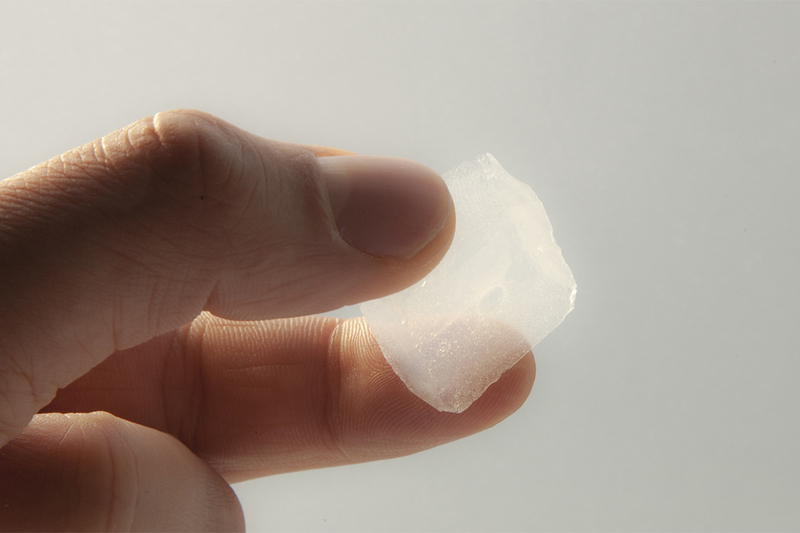 More recently researchers have developed aerogels that are reinforced by polymers. This method, which adds a thin polymer layer through chemical vapor deposition to the interior surface of the gel, not only makes the material less brittle but also greatly strengthens it while maintaining all positive attributes of traditional aerogels. Another, even more promising investigation looks at aerogels made entirely from polymers, which allows them to be made into a flexible film, robust against folding, crushing or creasing and about 500 times stronger than silica based aerogels. While NASA research focuses on the development of an inflatable heat shield that helps spacecrafts to safely descend and land , the combination of lightweight, durability and thermal insulation into a flexible film offers high potential for textile applications, like clothing, tents or sleeping bags as well as architectural building skins or partitions. M. Mecklenburg, A. Schuchardt, Y. K. Mishra, S. Kaps, R. Adelung, A. Lotnyk, L. Kienle, K. Schulte, “Aerographite: Ultra Lightweight, Flexible Nanowall, Carbon Microtube Material with Outstanding Mechanical Performance”. In: Advanced Materials 24 (26), pp- 3486 – 3490, 2012. Michael A. Aegerter, Nicholas Leventis, Matthias M. Koebel (Eds. ), „Aerogels Handbook“ (London: Springer, 2011), p. 3. Klassen Filiz, „Material Innovations: transparent, lightweight, malleable & responsive“. In: Klassen Filiz and Robert Kronenburg (Eds. ), „Transportable Environments 3“ (London: Spon Press, 2006), pp. 122 – 125. Silvia Leydecker, „Nano Materials“ (Basel: Birkäuser, 2006), p. 130. Dodson, Brian. : Flexible, high-strength polymer aerogels deliver „super-insulaton“ properties.